Investor Daily: Don't let short-term trends fool you. The precious metal should continue to rise. NEW YORK (Fortune) -- Gold may have a special place in the hearts of many investors, but it has not been immune from the forces that have hammered commodities from aluminum to zinc this year - the rising dollar and drastic economic slowdown. 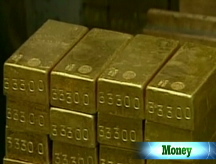 Since hitting a record near $1,030 an ounce in March, the price of gold has fallen about 25% to $775 as of Monday. Even so, the precious metal should still shine for investors in 2009. The case for gold begins with the fundamental weakness in the dollar. While investors have seen the dollar as a haven in the current economic crisis, that trend won't last, says Peter Sorrentino, a senior portfolio manager at Huntington Asset Advisors. That's because the vast amount of currency that the United States will have to print to fund TARP, potential auto industry aid and a massive U.S. government spending plan will create tremendous inflationary pressure and erode the value of the dollar. Moreover, currencies all over the world are declining in value as countries slash interest rates to stave off even deeper economic recessions and the banking system struggles to deal with massive write-downs and illiquid assets. Europe and China are rolling out their own incentive and bailout plans, points out Jim Vail, a senior portfolio manager at ING. "Financial assets are under pressure and the global money supply is growing rapidly," says Vail. With few currencies holding up in value, he believes investors and sovereign nations will soon turn to gold as a preferred reserve currency. Investors also want a liquid asset going into an uncertain economic environment. Over the past year, gold has been one of the few liquid assets that struggling money managers were able to sell to offset stock and bond losses. It pushed down the value of gold in the near term, but reinforced gold's reputation as safe and always valuable. Finally, a shortage of gold will likely keep a floor under prices (currently bouncing between $700 and $800) and push them higher in the future. Mark Johnson, who manages the USAA Precious Metals and Minerals Fund, says gold production is flat and could even fall as mines close and no major new mines are opened. Gold production could drop by 5% a year for the next five years, Mark Cutifani, chief executive of South African mining company AngloGold Ashanti, told the trade publication Mining World. In an October interview Cutifani said that South Africa's production had dropped by 20% to 30% over the past five years and that the quality of gold at mines around the world is getting worse. According to Sorrentino, the U.S. Mint ran through its annual gold supply marked for coins before the end of May. And Kitco, a popular Web site where investors can buy gold coins, says there is a delay in providing gold due to lack of supply. If you buy the bullish case for gold, one efficient way to invest is via an exchange-traded-fund, or ETF, because ETF fees tend to be much lower than those of actively managed mutual funds. One popular choice is the SPDR Gold Shares ETF (GLD), which holds gold in a trust. It charges a 0.40% annual management fee and is trading at $76, near the mid-range of its 52-week range. Investors willing to pay a slightly higher 0.94% fee might consider the Permanent Portfolio fund (PRPFX). The goal of the fund is to preserve capital, making it a good choice for troubled times. The fund's assets are divided between precious metals and Swiss-franc bonds to guard against inflation, while also holding Treasuries to guard against deflation. Looking for guidance in navigating these choppy markets? Let us know which topics you'd like us to cover and we'll try to address your questions in an upcoming Investor Daily. Please note: Fortune cannot give personalized advice on specific investments in your portfolio.